Air Busters utilizes only the best duct cleaning equipment for both residential and commercial jobs, including vacuum trucks, portable vacuum equipment, inspection cameras, motorized robots and Scorpion brush systems. The H1 Duct Truck is the most sophisticated and powerful duct cleaning truck on the market today. Built in 2016. The specially designed Biltwel duct cleaning truck from their Boss Series. Built in 2006. The Ranger, from Meyer Machines, is a high-powered portable gas vacuum used when our trucks are unable to access job site. The Abatement 2500 and 4500 are HEPA filtered portable electronic vacuums used for condos, high-rise buildings, and other commercial work. The Revolution Hybrid Duct Vacuum, from Hypervac, is a high-powered portable electronic vacuum used when cleaning difficult to reach systems. The finest Scorpion brush system available including predator whips to ensure a full a contact clean of entire system. Forward and reverse skipper balls which push and pull debris towards the vacuum in use. 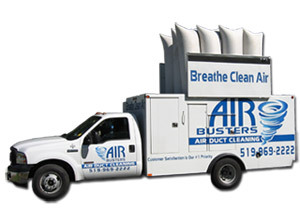 Air Busters Air Duct Cleaning uses state of the art equipment. Our two Ford Diesel powered trucks were built for the sole purpose of Air Duct Cleaning. The vacuum power of this unit is over 15000 cfm, and our 60 gallon Quincy compressor possesses 275psi of power. We use powerful brushes that go deep into your ductwork, moving the dust and debris toward our powerful vacuum to ensure a professional cleaning.